Beyond Baked » Gluten, nut, and refined sugar free old fashioned donuts! 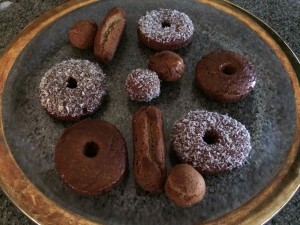 Home Blog Gluten, nut, and refined sugar free old fashioned donuts! I tried to make this a really healthy donut recipe. BUT… I just couldn’t sacrifice the good old fashion donut taste. I don’t love rice flours or starches but for this recipe they really work. If you like you can substitute different flours but I must tell you this combo makes a very good donut like consistency and when I played around with other they did not taste as good and authentic. So here it is, not my healthiest recipe ever but a really tasty old fashion donut with NO GLUTEN, NO NUTS, AND NO REFINED SUGAR. 4 -5 cups lard or coconut oil for frying Yes I use lard, good quality lard. I bought mine from US Wellness meats, it makes the donut taste amazing!! But you can use coconut oil instead. Mix all your dry ingredients in a large bowl. Mix all the wet ingredients in a medium bowl. Combine with a wooden spoon then knead the soft dough a bit. Let it sit for 3o mins. Knead it again and roll out on a clean, flour dusted surface to about 5/8 of an inch thick and cut out with a donut cutter or make “munchin” sized donuts with a small round cutter. I also like to just roll them up into balls about 1 1/2 in diameter or fat sticks. The kids like the sticks the best. *If it’s still a bit sticky when you roll it out add a touch more white rice flour. Heat the lard or coconut oil at about medium heat in a large pot so that it is about 2 inches deep. Fry only a few donuts at a time. They go quickly so be prepared with a paper towel lines surface to place them when they come out of the oil. Fry each donut for about 2 -3 minutes or until a good dark brown color, flipping if need be. If they are golden in color they probably aren’t cooked all the way through yet. A. A mixture of equal parts coconut sugar, maple syrup, and coconut nectar. B. Simply use the coconut nectar. C. Glazed with coconut nectar, then dipped in coconut. These taste very similar to a old favorite Dunkin donut of mine.